Mardi Gras is a feast or festival celebrated by French Catholics just before fasting during Lent. In French, Mardi Gras literally means Fat Tuesday, because many people would overeat and party before the restrictive Catholic ritual took place. Franco-Americans still feast during Mardi Gras, but New Orleans has become known for the greatest celebration of them all. Face and body painting is extremely popular during Mardi Gras, with people wearing ornate masks, of which many are painted on to the face. This article is a brief description on how to face paint a Mardi Gras mask. Each mask can be considered unique, and there are numerous images of masks online that can be imitated. Teardrop swashes and hearts and diamonds are very popular within the style. Face painted Mardi Gras masks are considered a form of art by many people, and can be very fashionable during the traditional celebration or at a masquerade party. Always seek professional advice before attempting face or body painting. Always follow the instructions and warnings of any paint, brush, tool, or product required for face or body painting. One of the most popular face painting designs available are Mardi Gras masks. Some supplies you will need are a number 2 and number 4 round brush that you can buy at sillyfarm.com, Michael's, or at your local arts and crafts store. Try to choose a brush that you are comfortable with. Some of the brands that are highly regarded are the Wolfe or Mark Reid brushes that you can find online, or the American Painter series available at Michael's. 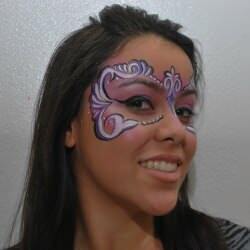 You will also need face paints in a variety of colors, or pressed powdered paints, makeup sponges, and glitter. In the design in the photograph, Ben Nye Lumiere Pallete was used as a base, and Wolfe in the white, black, and metallic purple. These brands are available online at sillyfarm.com or amazon.com. Water based makeup should be used, and one should avoid paints that contain acrylic or tempra. Just because a paint is labeled "non-toxic," does not make it completely safe for the skin. There are a few things to keep in mind when painting a Mardi Gras mask. To start off, it is important to apply a colored based around the eyes and down the center of the eyebrows. These are the areas that the observer is most attracted to. You want to combine at least two colors above the eyes and a third one to highlight underneath the eyebrows and the cheekbones. Lastly, always strive to make your design lean upwards with your strokes and your base color. Your design should be heavier at the top and around the eyes than towards the nose and down the cheeks. After applying the base, use it to guide you in developing the shape of the rest of your design. Start with light colored swirls at the corner of the eyes. These swirls can then be linked to more swirls until you get closer to the nose. The next stroke to use is the teardrop. Choose areas where two swirls meet and group them there to make a fan of teardrops. Embellish your design with dots, stars, hearts, or other shapes. Next, highlight each swirl, teardrop, dot, star, etc., with a darker color such as blue, purple or burgundy. Finish your line work by outlining the mask in black. Try to stay close to the existing design for congruency. Finish it all off by sprinkling glitter above the cheekbones, eyebrows and points where two or more lines or shapes meet. Enjoy your Mardi Gras mask, and be safe at that festival or masquerade party! Noteworthy, Boston also had a sort of Fat Saturday feast during Puritan times. Most activities were strictly forbidden on Sundays, and Baked Beans were cooked on Saturday nights and left on the fireplace hearth to be enjoyed on Sunday. It was a clever way of complying with the Blue Laws, and remained a ritual that lasted into the 1930s (baked beans on Saturday nights). Face painting tips provided by OkidokiFacePainting.com.